You will learn how to use a walker , crutches , or other support devices. 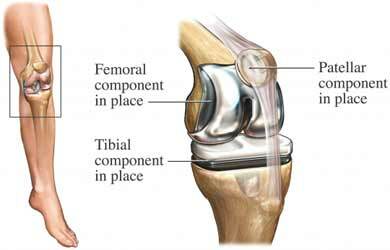 Total knee arthroplasty. EBSCO DynaMed Plus website. Available at: https://www.dynamed.com/topics/dmp~AN~T360995/Total-knee-arthroplasty . Updated March 13, 2018. Accessed March 27, 2018. 4/16/2009 DynaMed Plus Systematic Literature Surveillance https://www.dynamed.com/topics/dmp~AN~T360995/Total-knee-arthroplasty : Harmer AR, Naylor JM, Crosbie J, Russell T. Land-based versus water-based rehabilitation following total knee replacement: a randomized, single-blind trial. Arthritis Rheum. 2009;61:184-191. 6/2/2011 DynaMed Plus Systematic Literature Surveillance https://www.dynamed.com/topics/dmp~AN~T360995/Total-knee-arthroplasty : Mills E, Eyawo O, Lockhart I, Kelly S, Wu P, Ebbert JO. Smoking cessation reduces postoperative complications: a systematic review and meta-analysis. Am J Med. 2011;124(2):144-154.e8. 9/16/2014 DynaMed Plus Systematic Literature Surveillance https://www.dynamed.com/topics/dmp~AN~T360995/Total-knee-arthroplasty : Abdallah FW, Chan VW, et al. The analgesic effects of proximal, distal, or no sciatic nerve block on posterior knee pain after total knee arthroplasty: a double-blind placebo-controlled randomized trial. Anesthesiology. 2014 Aug 5. [Epub ahead of print].